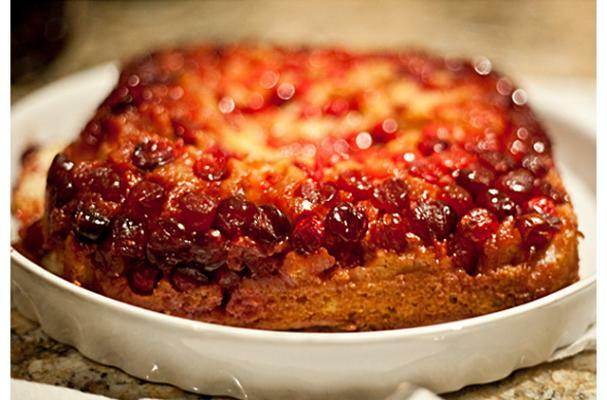 Perfect for Thanksgiving or Christmas, this insanely deliciously gluten free cranberry upside down cake is as impressive as it is delicious! The perfect partner for pumpkin or pecan pie, this sweet-tart treat will leaves your guests wondering "How did she do it?" as they get in line for a second helping! Preheat oven to 350 F, with a rack set in the center. Place an 8-inch round and 2-inch deep cake pan on a baking sheet. In a small bowl, whisk together the flour, baking powder, spices and salt. Melt 6 Tbsp of butter in a small saucepan. Stir in 6 Tbsp of sugar and cook, stirring constantly, until the mixture begins to bubble and boil. Pour the caramel into the cake pan, covering evenly. Sprinkle the nuts over the caramel, then add the cranberries, smoothing and pressing down as you go along. Beat in the eggs, one at a time, allowing enough time for each egg to become fully incorporated into the batter, scraping down the sides as needed. Add vanilla and reduce mixer speed to low. Add in half of the dry ingredients, mixing well. Mix in milk and the remaining dry ingredients. Pour the batter into the cake pan over the cranberry-caramel mixture, smoothing the top with a spatula. Place the cake pan, still on the baking sheet, in the oven and bake for 40-45 minutes or until a knife inserted into the center comes out clean and the cake is golden brown. Remove the cake from the oven and run a knife along the edge of the pan to loosen. Place an inverted serving plate over the cake pan and carefully flip the cake and plate over, removing the cake pan. Serve warm with fresh whipped cream. Don't see that in the ingredients list?